A crisis such as Harvey brings devastation to a community, but it also creates opportunities for discovery. University of Houston-Downtown (UHD) students are experiencing this firsthand as the city continues to recover from this catastrophic storm. While Harvey's rains caused visible flood damage to homes and communities throughout Houston, there were numerous unseen dangers to the city. Bacteria levels were on the rise in Houston's natural waterways, including UHD's neighboring Buffalo Bayou. The City of Houston Health Department's Bureau of Pollution Control and Prevention was on the case analyzing water samples and discovering large traces of E. coli bacteria in Houston's bayous, creeks and reservoirs. Further samples were required from throughout the city, and that's where UHD students came in. 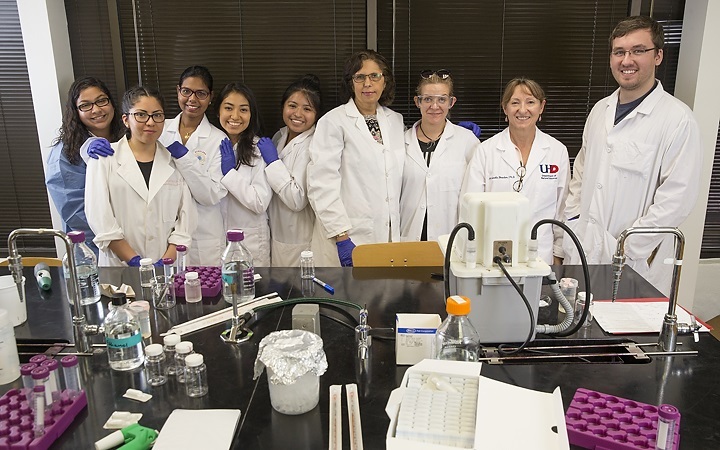 Led by microbiology professors Dr. Gabriela Bowden and Dr. Poonam Gulati Salhotra, 10 UHD students, mostly recruited from the Scholars Academy, began gathering samples from Houston-area waterways and providing them to city researchers. Students from the University of Houston (led by professor Dr. Dan Price) also participated in the sampling process. Using buckets and water receptacles, students replicated the city's sampling procedures and gathered duplicate samples for further research in UHD's laboratories. "For a while the bacteria levels were very high due to sewage that made its way into the city's waterways," Gulati said. "The samples, however, are now producing better results and water seems to be getting back to normal." According to Gulati, this is good news for Houstonians. Although creeks, reservoirs and bayous do not produce drinking water, community members still come into contact with these waterways. People kayak, fish or wade in these waters. And these waterways comprise a large portion of the city's ecosystems, so bacterial disruptions will have an impact on more than just people. "It can have a downstream effect," Gulati said. "If the bacterial population changes, it could impact the dissolved oxygen in the water, which would affect other organisms." Although samples are normalizing, Gulati said she and other faculty members hope to conduct a historical analysis of these waters. Along with Bowden and chemistry professor Dr. Mian Jiang, they hope to discover the long-term effects on bacterial communities; the chemistry of the water, and how traumatic incidents, such as Harvey, produce more and different contaminants. Ultimately, this data will be useful during future storms. The process of sampling and analyzing the water provided UHD students an outstanding research opportunity and afforded them to give back to the community. "It's empowering for students to realize that they are using science to answer questions and benefit society," Gulati said. "Our students also benefit because they are part of a major community study that will contribute to science as a whole and help Houston in the event of another Harvey."